As a part of the centennial celebration, we thought our readers might enjoy a nostalgic look at our posts on City Market that have appeared on Goodnight Raleigh over the years. Happy Birthday City Market — May you serve Raleigh for another hundred years! 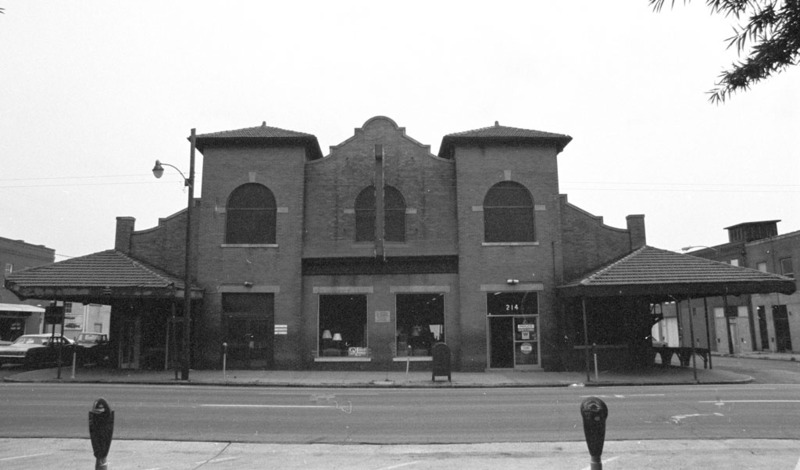 Below is a sampling of historic photos taken of City Market during its first half century. 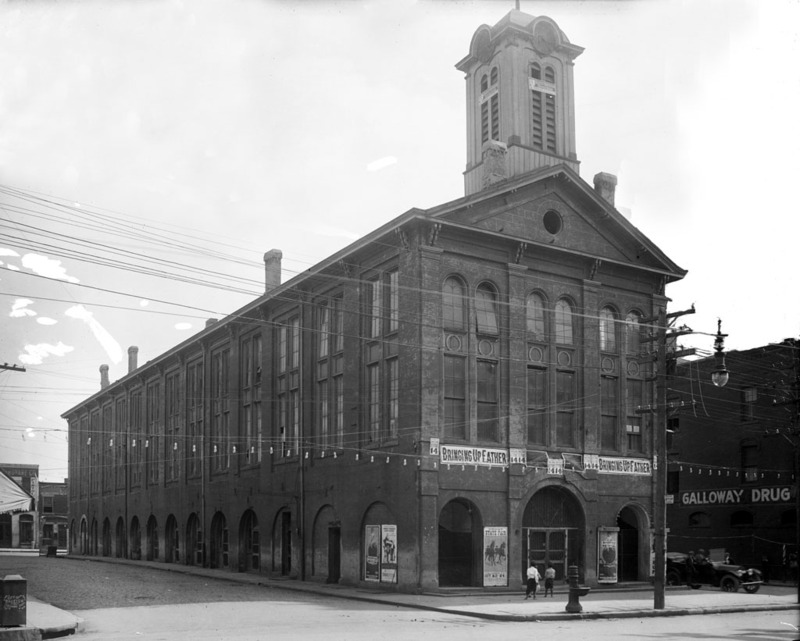 The two photos seen here show the City Market when it was located on Fayetteville St. 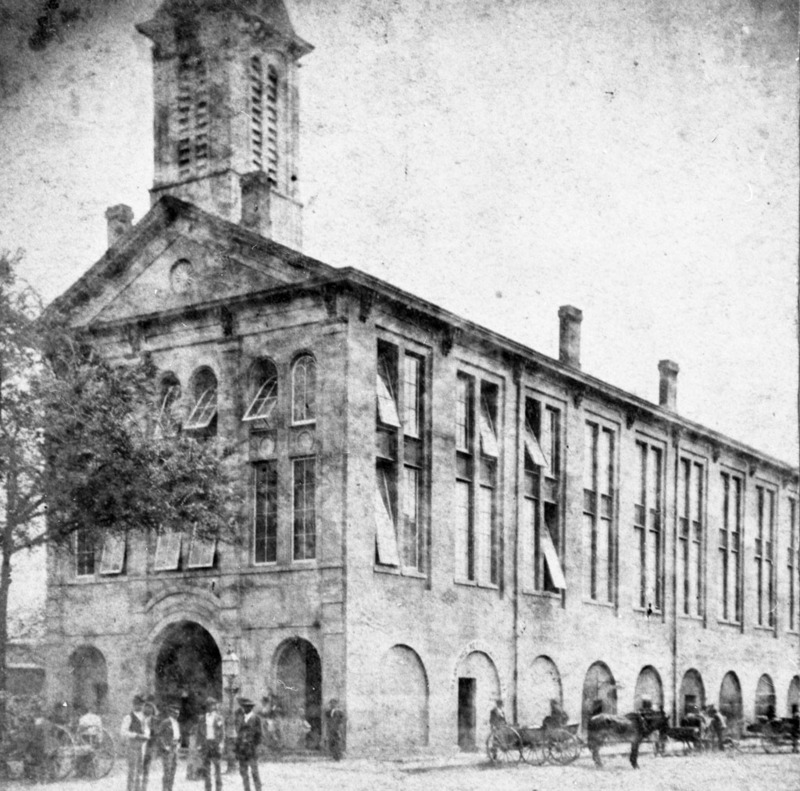 It was erected in 1870 on the site of Raleigh’s second market building, which had been destroyed by fire in 1868. 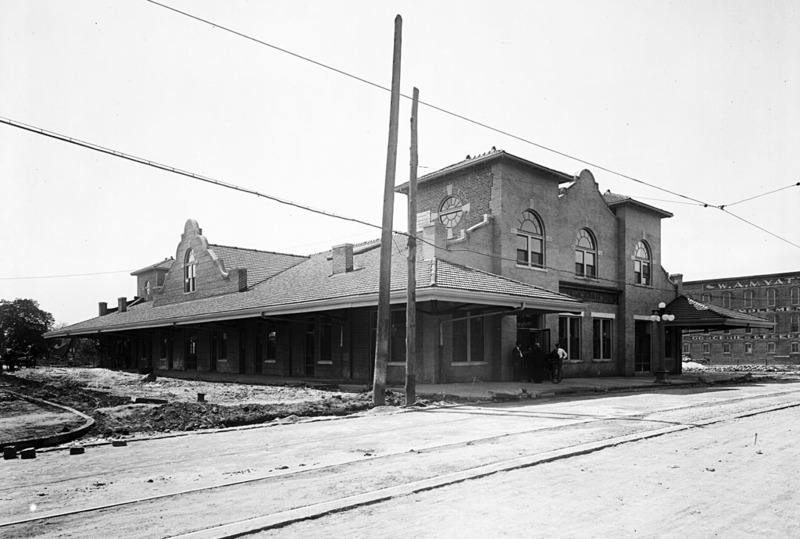 This is the market building replaced by the Moore Square building in 1914. The photo above was taken ca 1873, just a few years after the Fayetteville St. market was built. Below is how the building appeared shortly before the city closed it in 1914. The city relocated the market to a less congested area, Moore Square, in 1914. The Spanish Mission style building was designed by Raleigh architect James Matthew Kennedy. 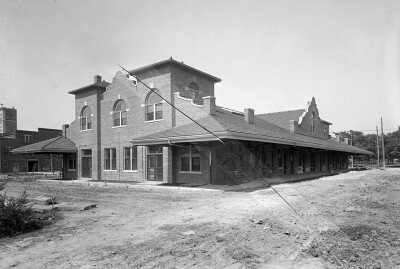 Kennedy’s City Market featured fireproof construction, with steel roof trusses, solid brick walls and a red tiled roof. The new building was considered a ‘sanitary’ improvement over the old market, as the interior was an open and airy space, faced with white-glazed ceramic tile walls, and a smooth concrete floor which could easily be hosed down after the day’s activity. 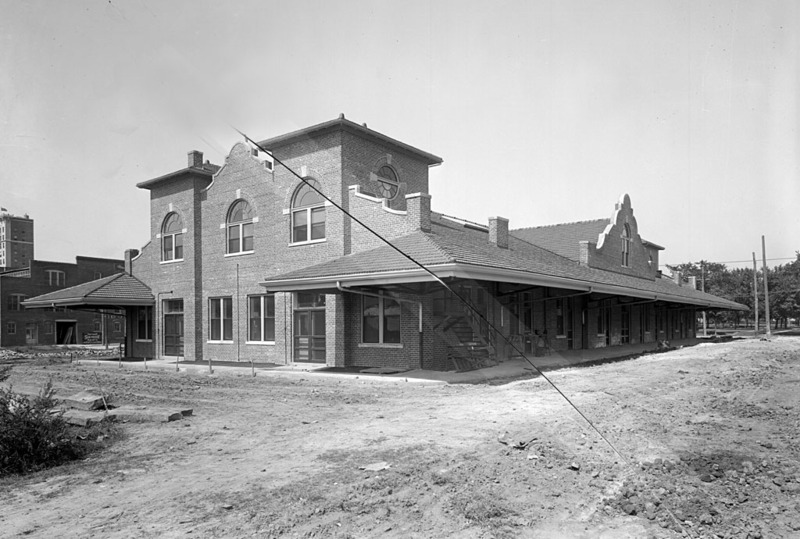 These photos show the building not long before it opened to the public on September 30, 1914. Above, Belgian block pavement is being laid, which still exists today. The Martin St. facade is faced with buff-colored brick. Below is the southern facade, which, excepting the buff brick, is identical to its Martin St. counterpart. This view is looking southeast from Martin St.
City Market flourished in downtown Raleigh for more than 40 years. The view below of a busy market day was taken in the 1940s. 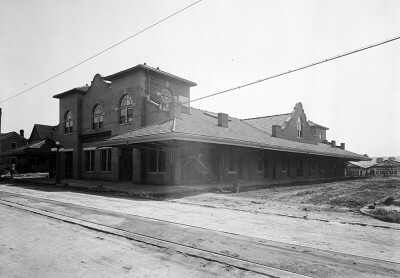 The general suburbanization of Raleigh’s population during the 1940s and ’50s, coupled with the emergence of neighborhood supermarkets and the opening of the new State Farmer’s Market, led to the demise of City Market as a destination marketing venue. Thus, the City closed its downtown central market in 1957. It was sold into private hands in 1959, and the new owner subsequently converted the interior space for use as a furniture store. Produce continued to be sold under the massive canopy, however, for the next 20 years. 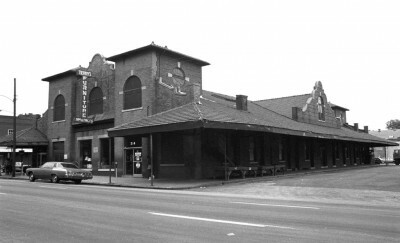 These photos show how the market building appeared in the 1960s. By the 1980s City Market and the Moore Square area were in a state of serious decline. 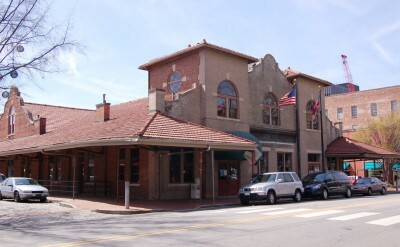 The City again entered the picture and repurchased the building for public rehabilitation and private development. Small businesses such as restaurants, specialty shops, bars and coffee shops moved into vacant storefronts in the late 1980s, and the area began to see a reemergence as a downtown retail center. The building was purchased by a private developer in 1990s, who made further upgrades. Since then City Market has continued its growth as a retail anchor on Moore Square. 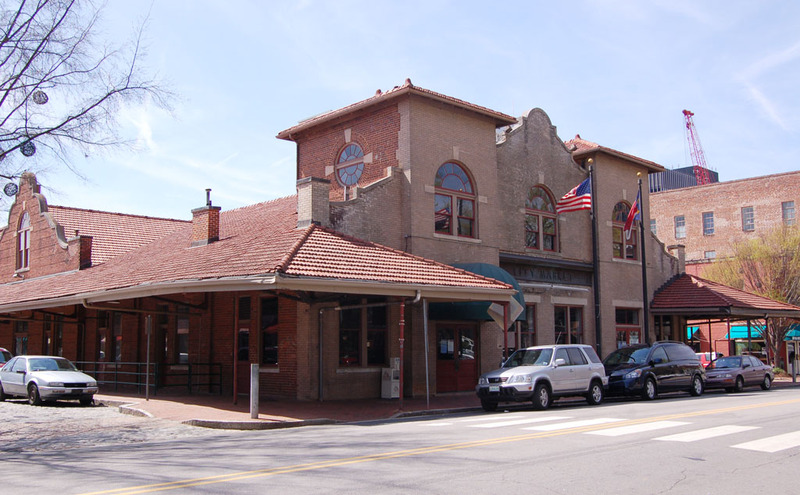 City Market has been designated a Raleigh Historic Landmark. I like this. I wish someone had pics of the inside in the 60’s. My mother and I would walk down there from Person and Polk. I still remember the smell in the summer. Good old days. Bill Mills I may have posted incorrectly. I was talking about the inside of the City Market. I read this again. I didn’t notice before that it closed as a market in 1957. I was 10 then. That means I was younger than 10 in my memories. WOW! So I want pictures of the inside before 1957. That might be difficult. I am almost 68 now. I am always looking for pics of my childhood memories. Too bad the current owners are not working to keep it an eclectic local! The rent is too high. I saw in an older post about Person Street that you had identified the bricks with the “Old Reliable Honeycutt” logos. As noted by a cousin in a previous post, our mutual GGF, Fabius Watson Hunnicutt, was a prominent builder that used these in his work. He also was involved in building the Old City Market and I am told by the family some of those bricks are in this building too (also on Capital Square), but have not found one yet. Got to keep looking…. I remember seeing the Honeycutt logo somewhere near my home. I lived on Person and Polk and walked to downtown 100’s of times. I remember it was on corner. Wish I remembered which corner. Does seem like it was near the governors mansion. Just keep walking in that area and you will find it. LOL I know this sounds silly but you really could find it that way. Is this what you saw, Jimmy Cox? Yes, I saw the original brick logo post from the Person Street blog entry. I have been looking for the other locations in the down-town area where these bricks have been sited including Capital Square and the City Market. My husband’s grandfather was James Matthew Kennedy, this very architect. It is fun for me to read about him. We just moved back to Raleigh after living in Atlanta the last 32 years. I look forward to locating more of Grandfather Kennedy’s buildings. Thank you for this article.